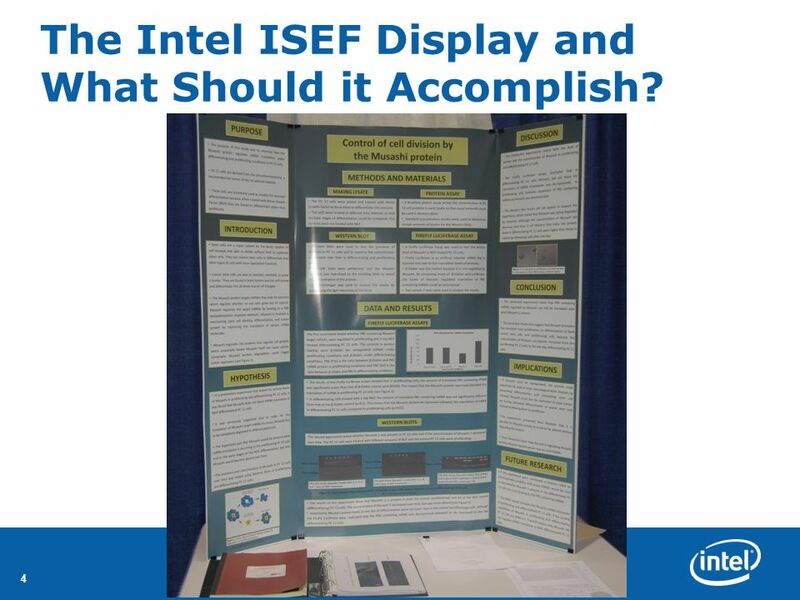 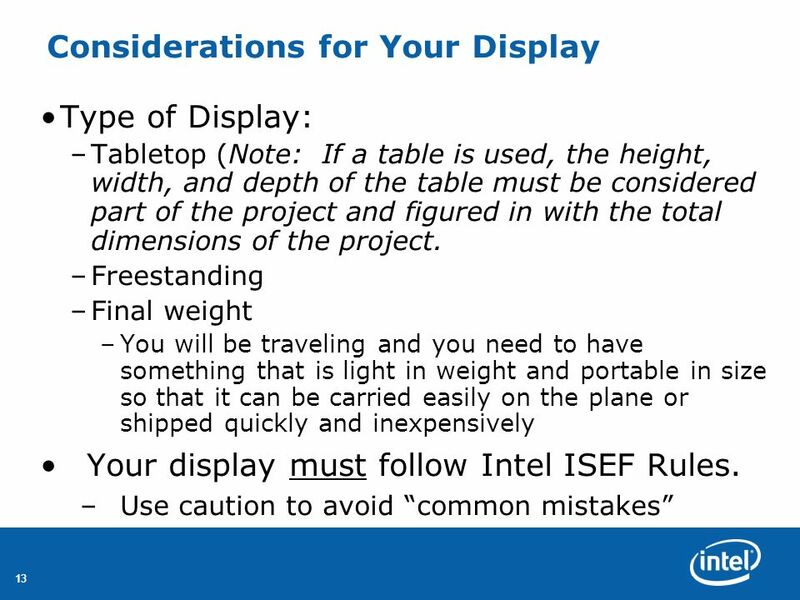 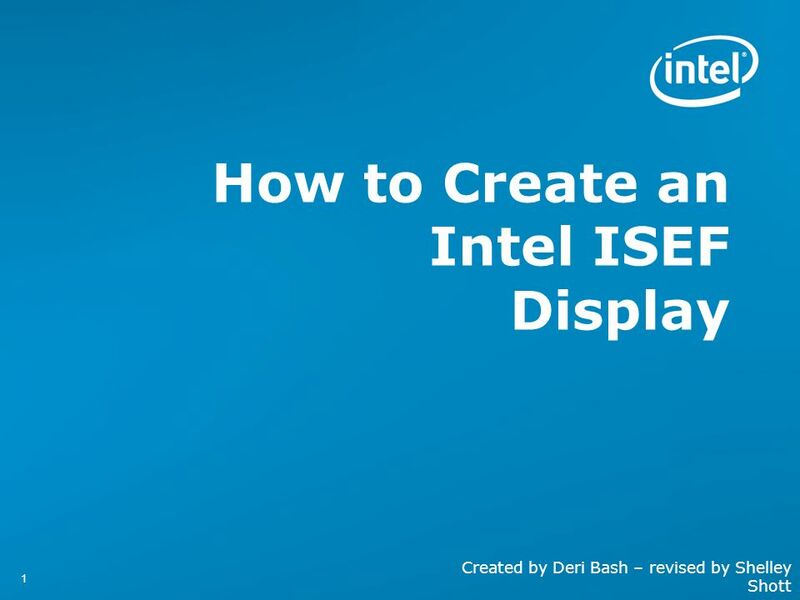 4 The Intel ISEF Display and What Should it Accomplish? 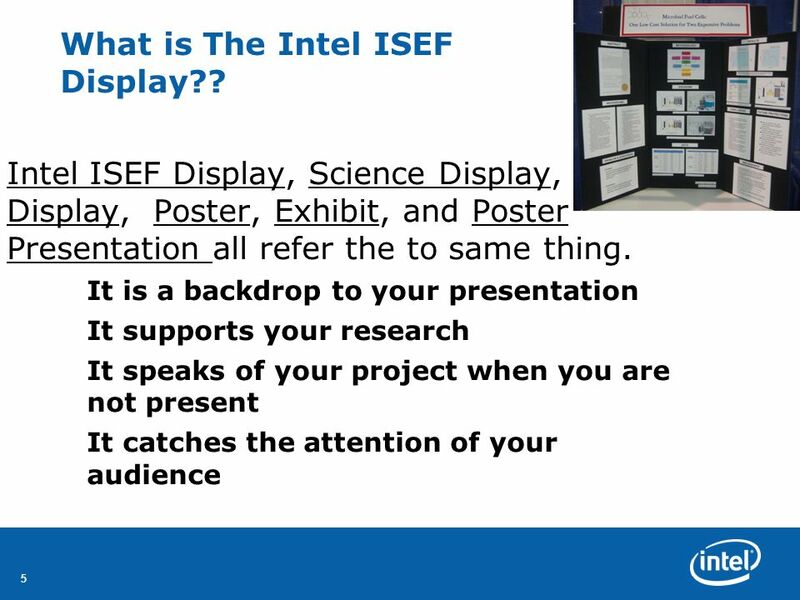 5 What is The Intel ISEF Display?? 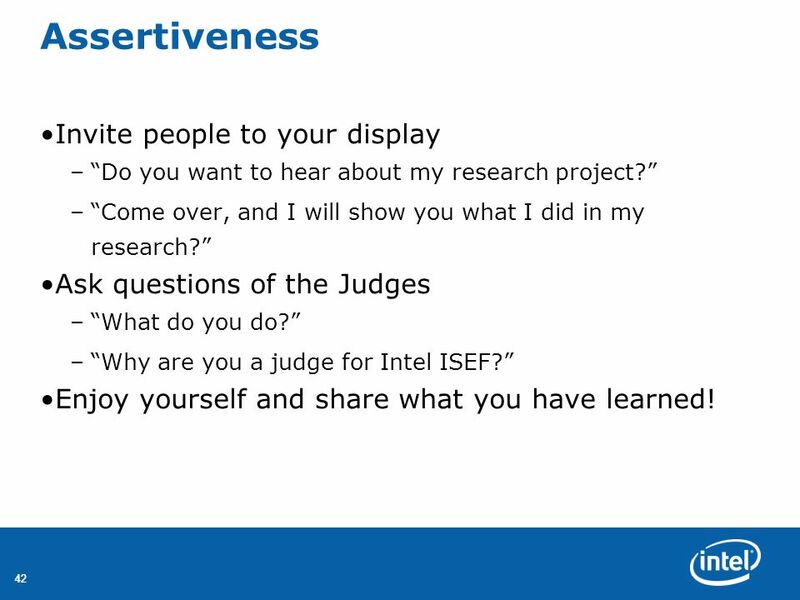 6 What Should it Accomplish? 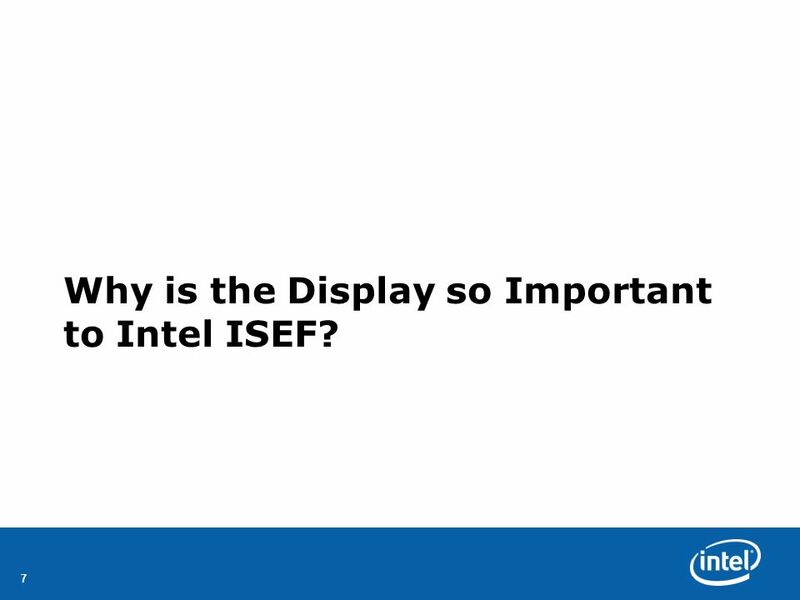 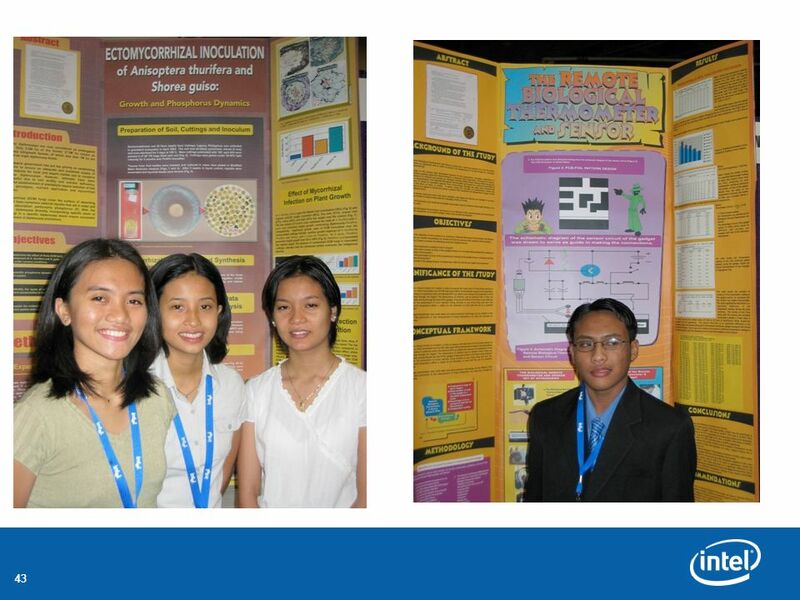 7 Why is the Display so Important to Intel ISEF? 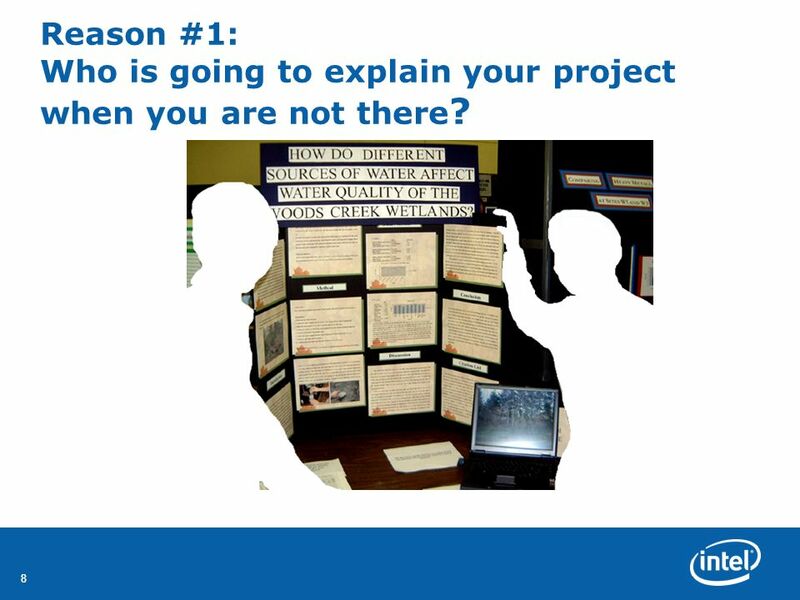 8 Reason #1: Who is going to explain your project when you are not there? 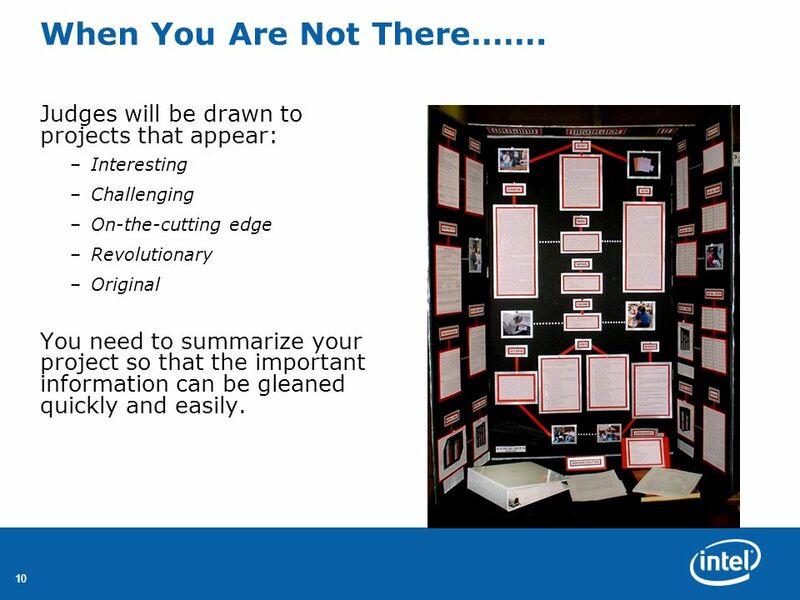 9 When You Are Not There……. 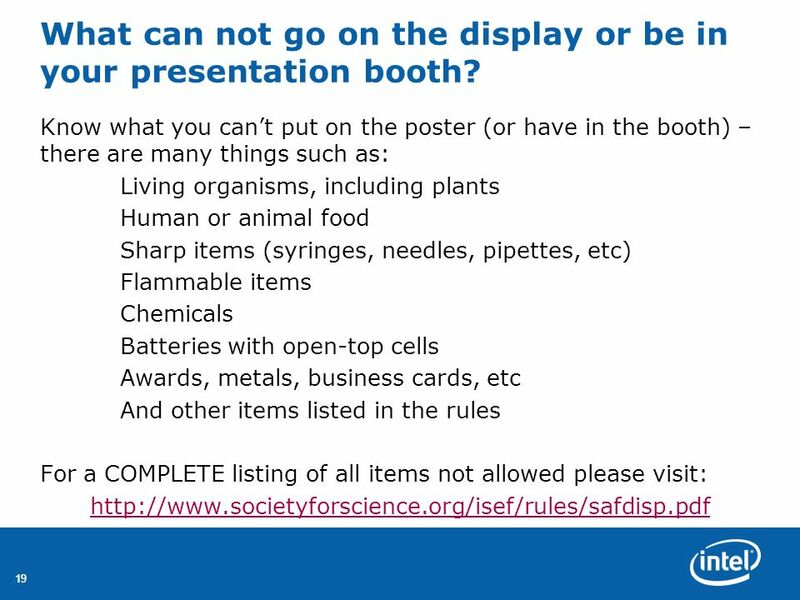 For a portion of the judging, you will not be present with your project materials. 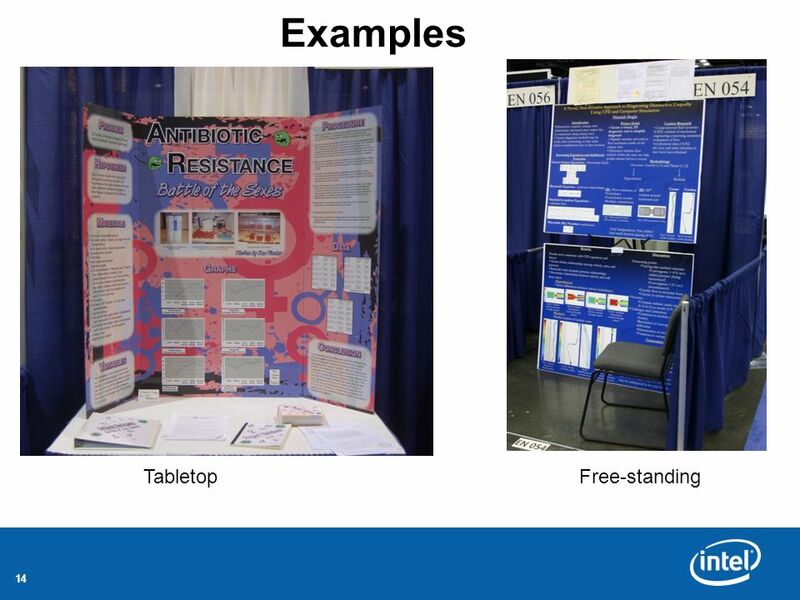 When you are not present, your poster is the only communication with the judges. 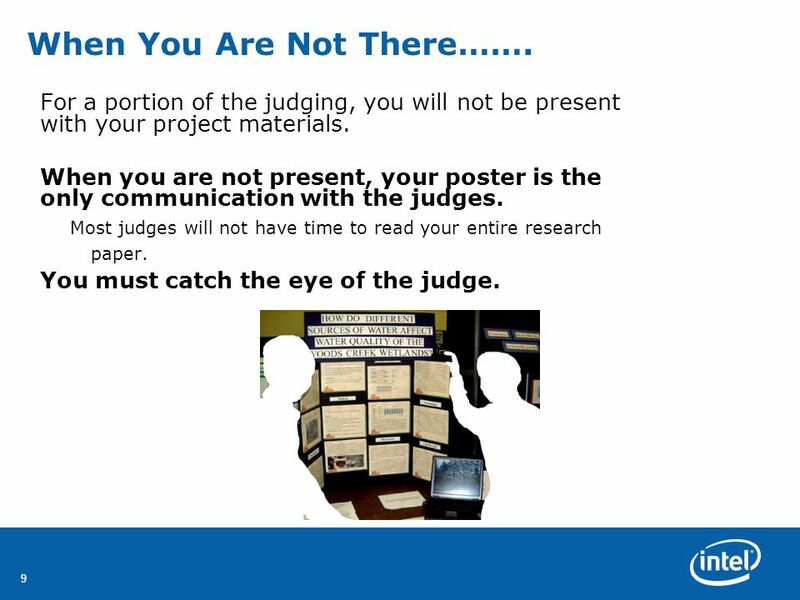 Most judges will not have time to read your entire research paper. 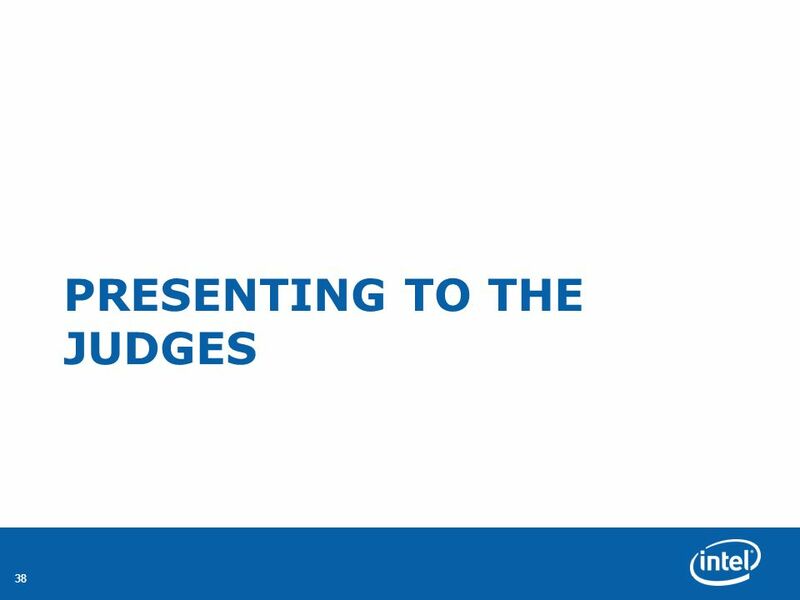 You must catch the eye of the judge. 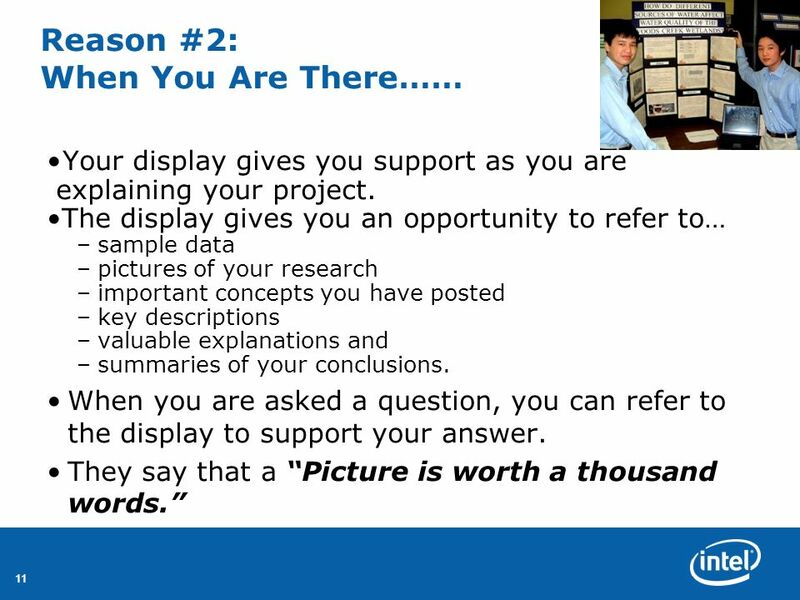 10 When You Are Not There……. 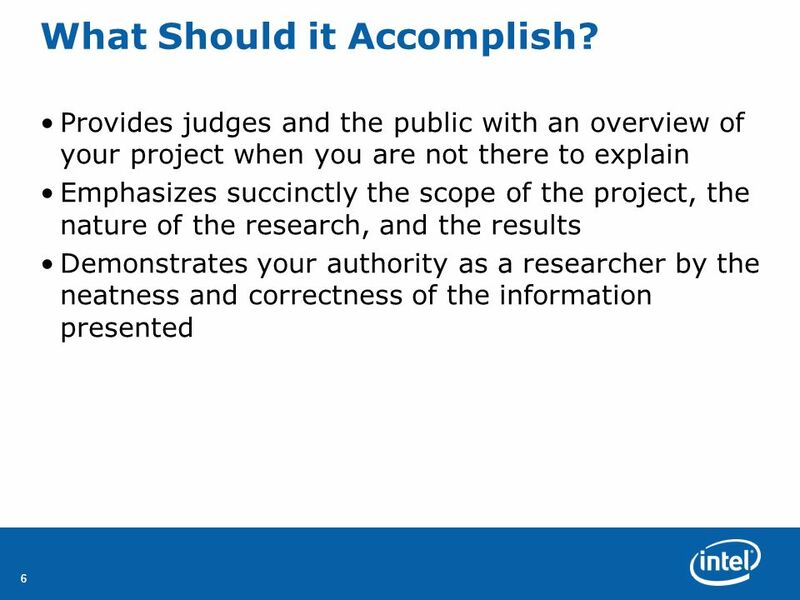 Judges will be drawn to projects that appear: Interesting Challenging On-the-cutting edge Revolutionary Original You need to summarize your project so that the important information can be gleaned quickly and easily. 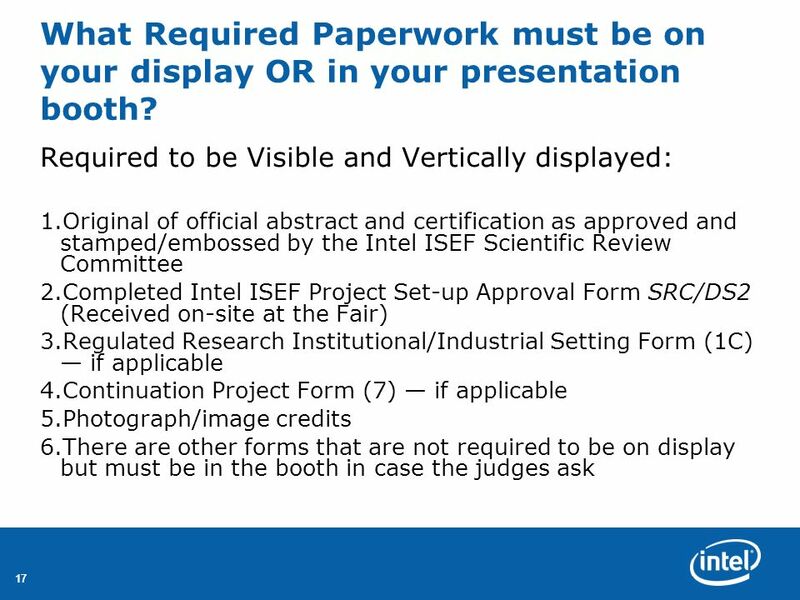 17 What Required Paperwork must be on your display OR in your presentation booth? 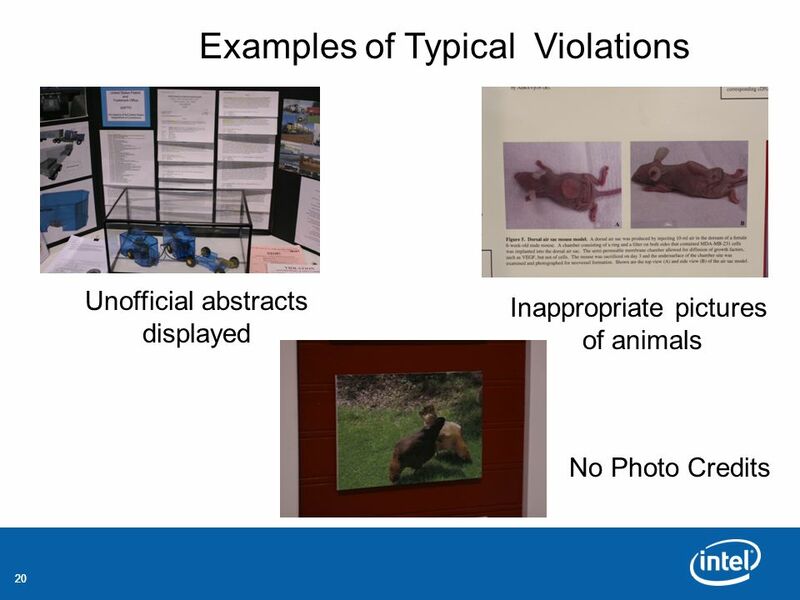 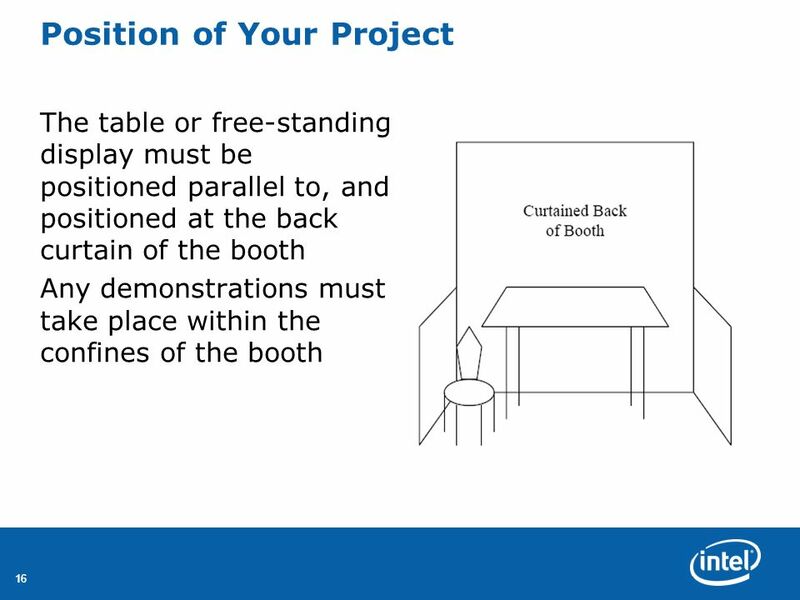 19 What can not go on the display or be in your presentation booth? 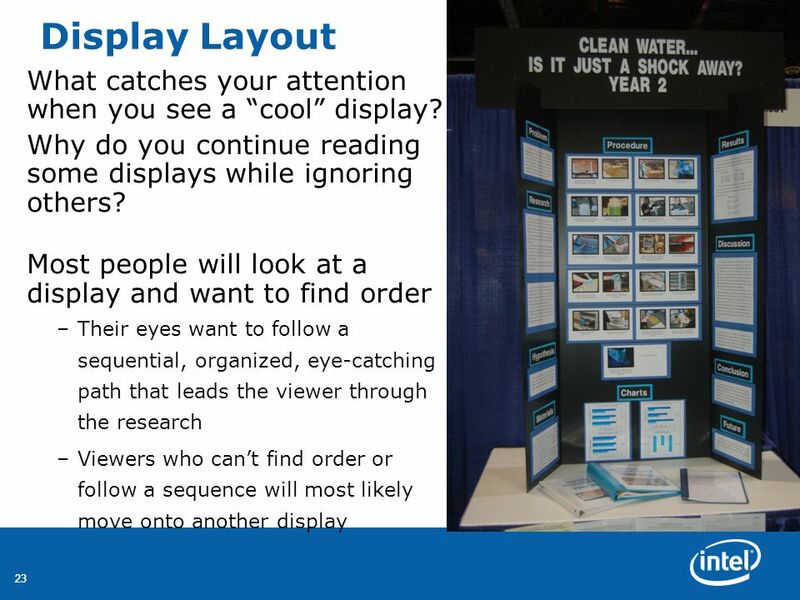 Make sure the display is organized! 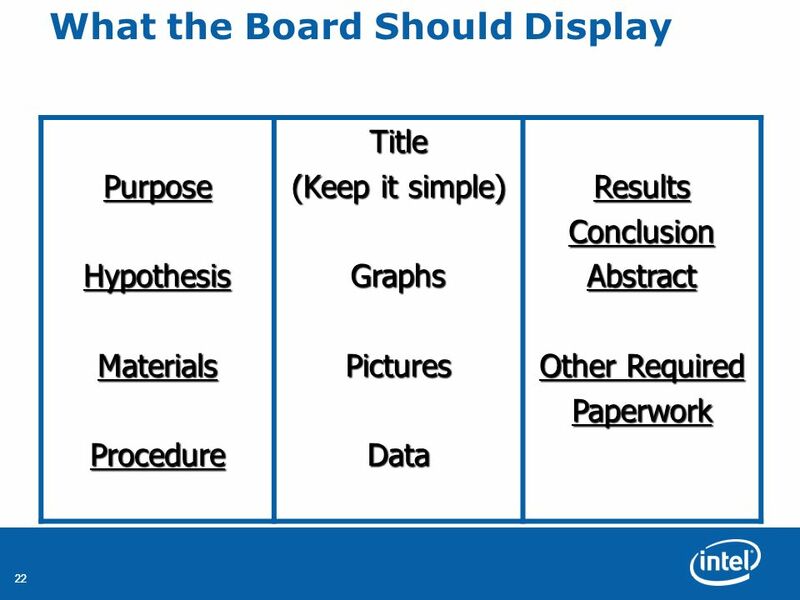 Make sure your research is complete BEFORE starting your poster There is no substitute for content!! 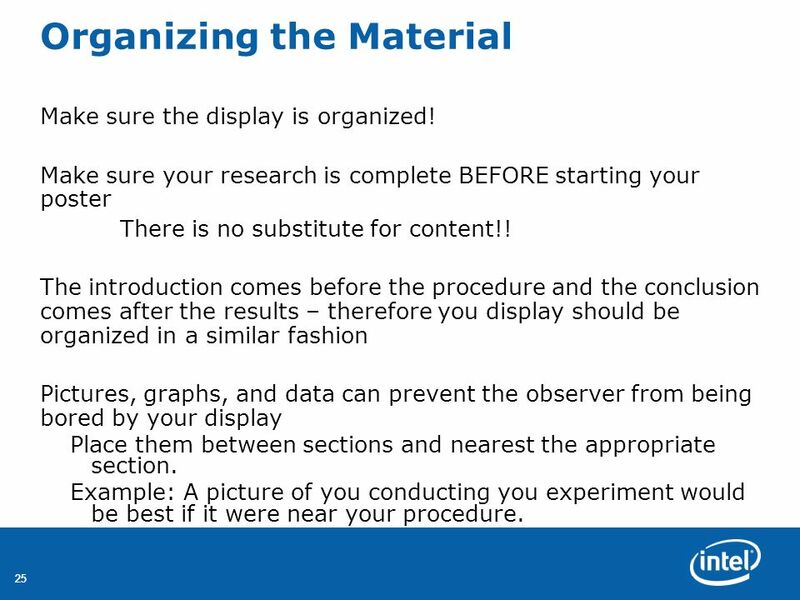 The introduction comes before the procedure and the conclusion comes after the results – therefore you display should be organized in a similar fashion Pictures, graphs, and data can prevent the observer from being bored by your display Place them between sections and nearest the appropriate section. 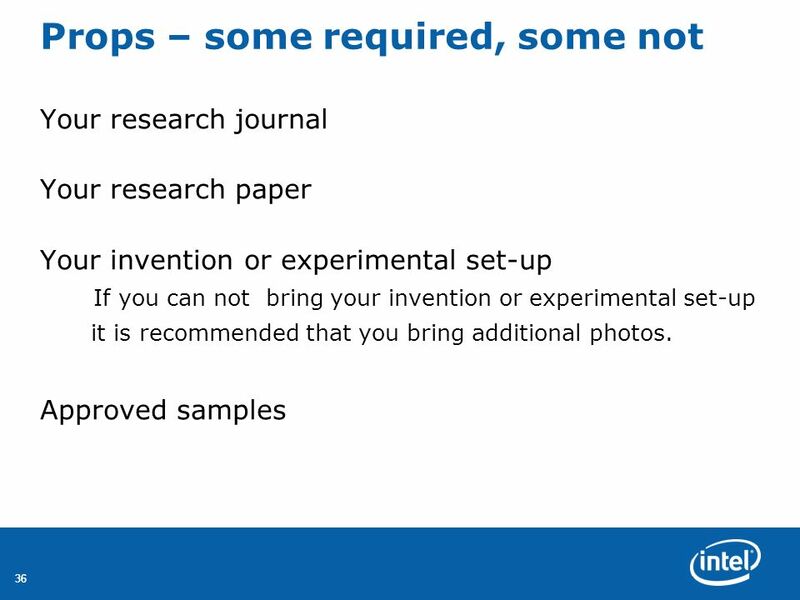 Example: A picture of you conducting you experiment would be best if it were near your procedure. 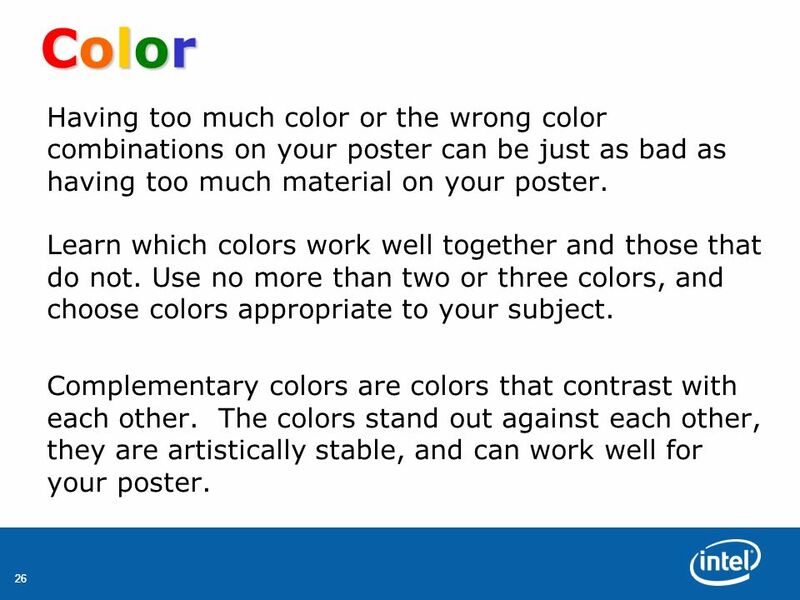 26 Color Having too much color or the wrong color combinations on your poster can be just as bad as having too much material on your poster. 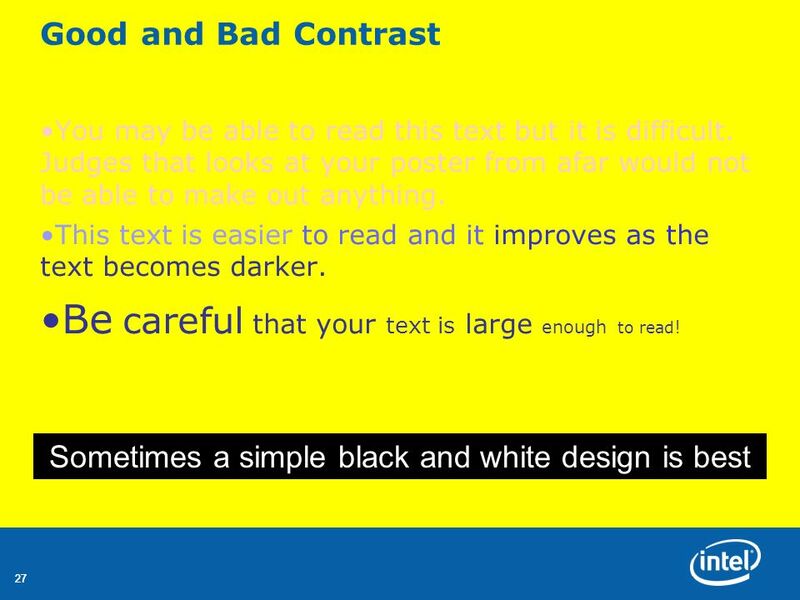 Learn which colors work well together and those that do not. 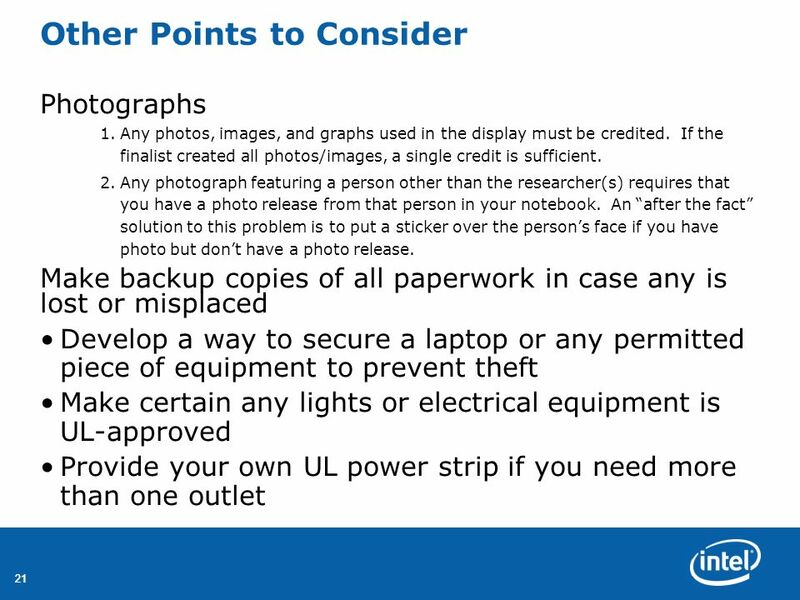 Use no more than two or three colors, and choose colors appropriate to your subject. 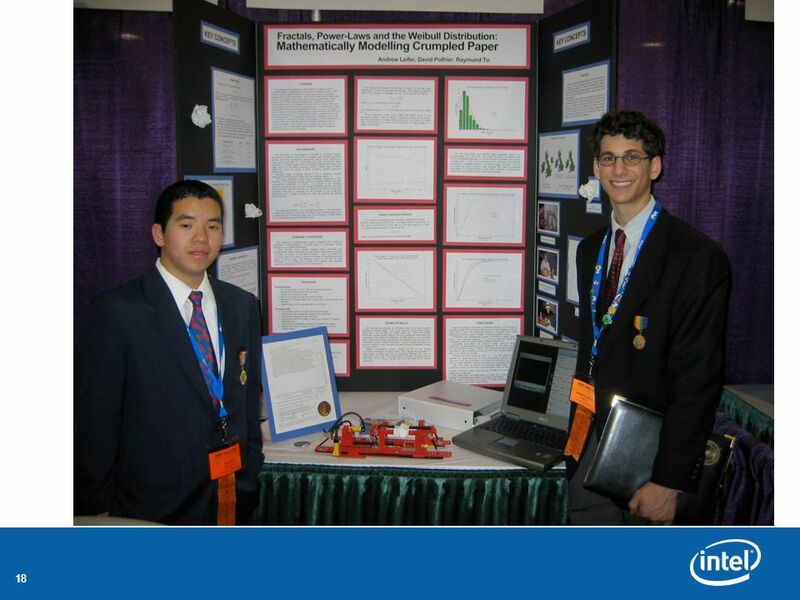 Complementary colors are colors that contrast with each other. 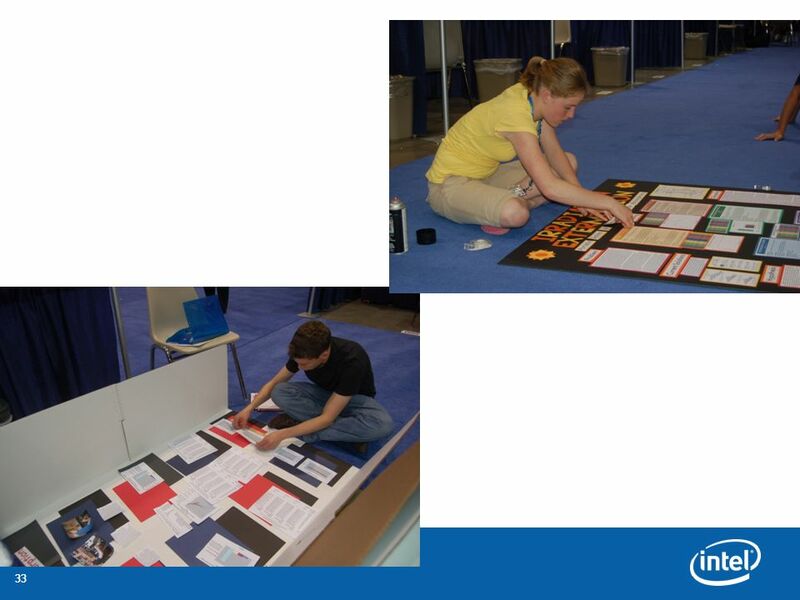 The colors stand out against each other, they are artistically stable, and can work well for your poster. 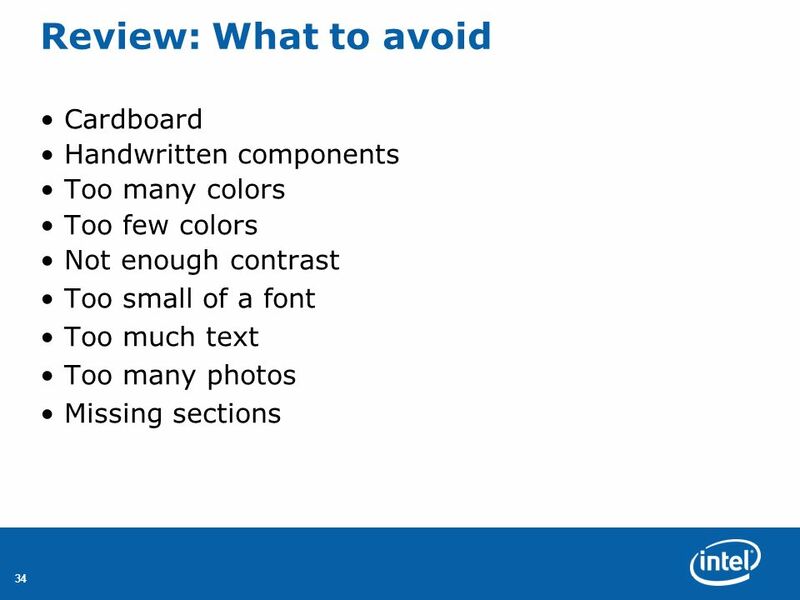 Decide a color that you might like to use for your background, font, or matte. 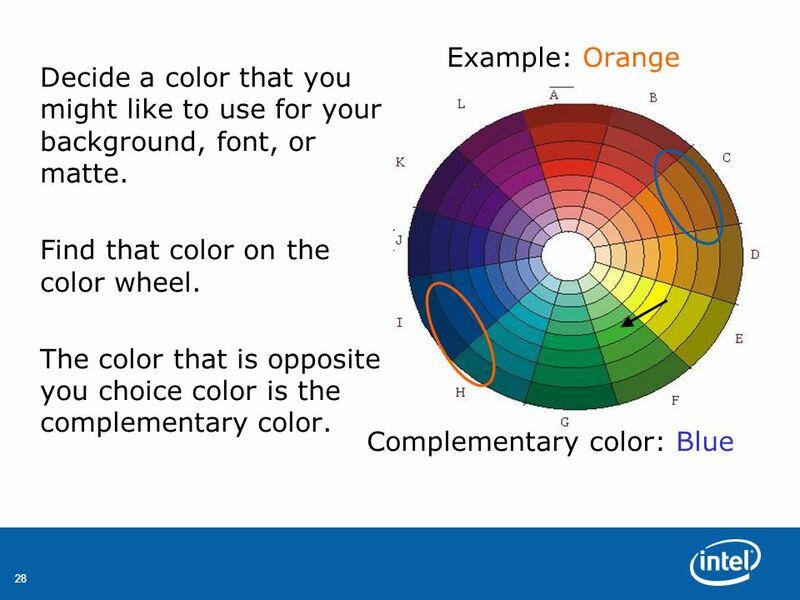 Find that color on the color wheel. 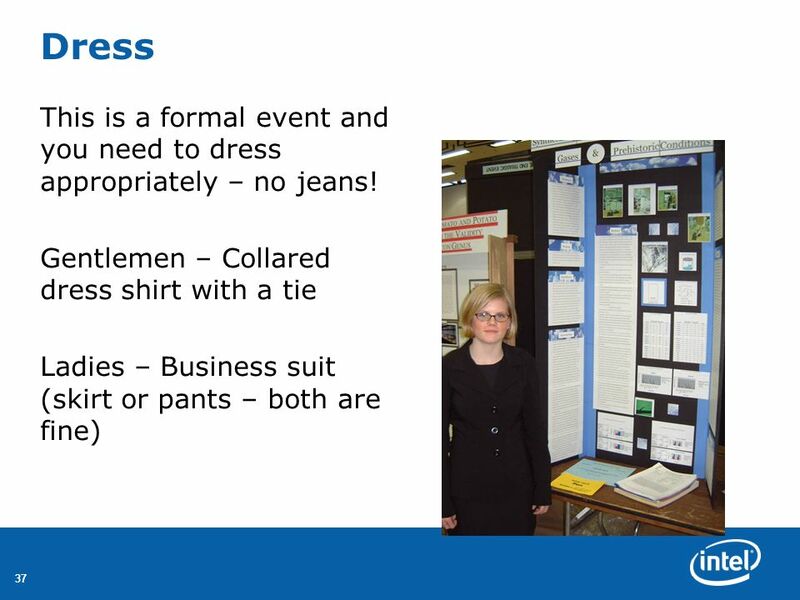 The color that is opposite you choice color is the complementary color. 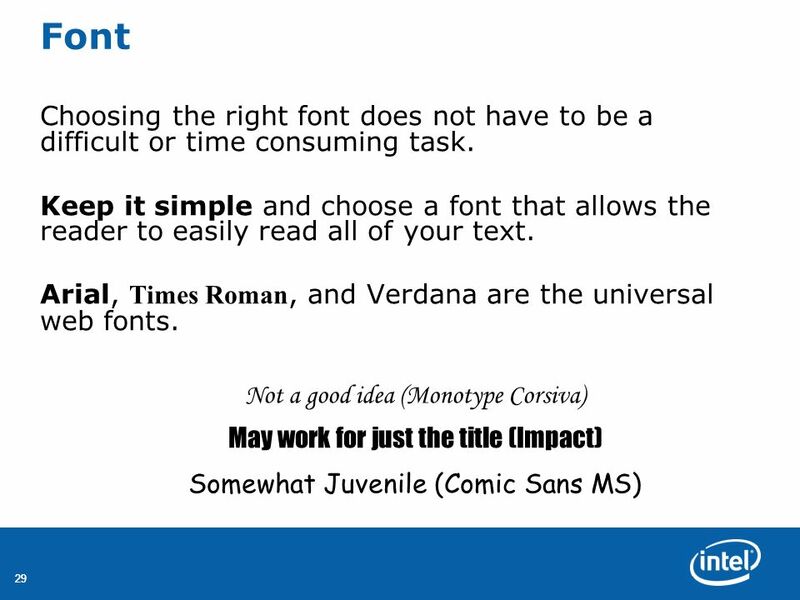 30 Font Size You want you title to be visible from afar – It should be readable from a minimum of six feet. 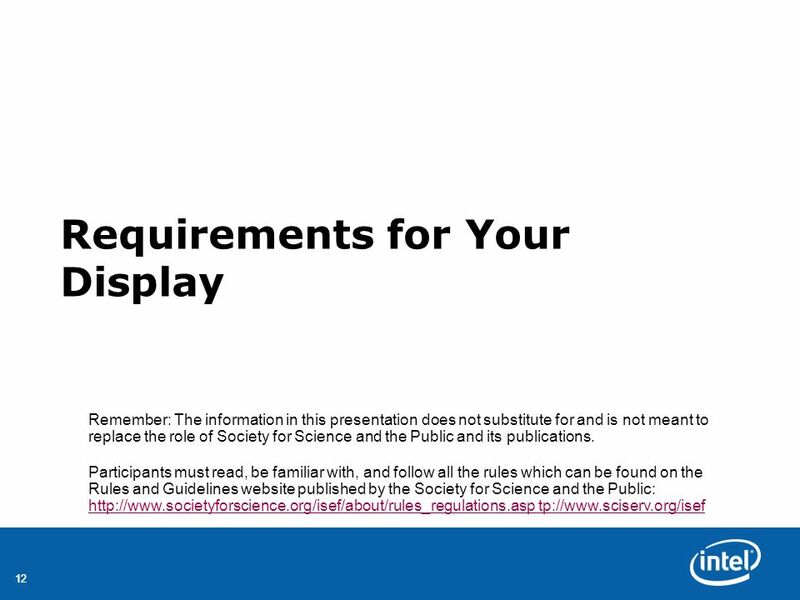 For your title: try to develop a phrasing that captures attention but succinctly represents your research. 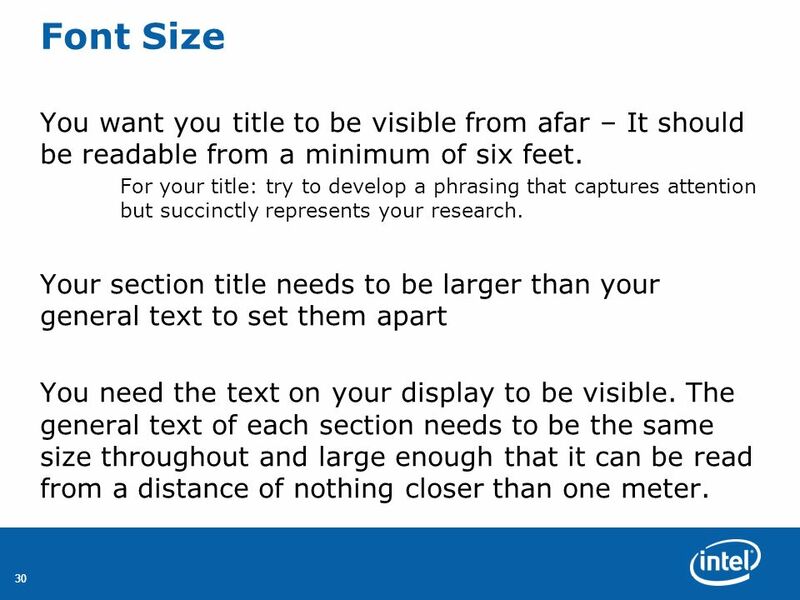 Your section title needs to be larger than your general text to set them apart You need the text on your display to be visible. 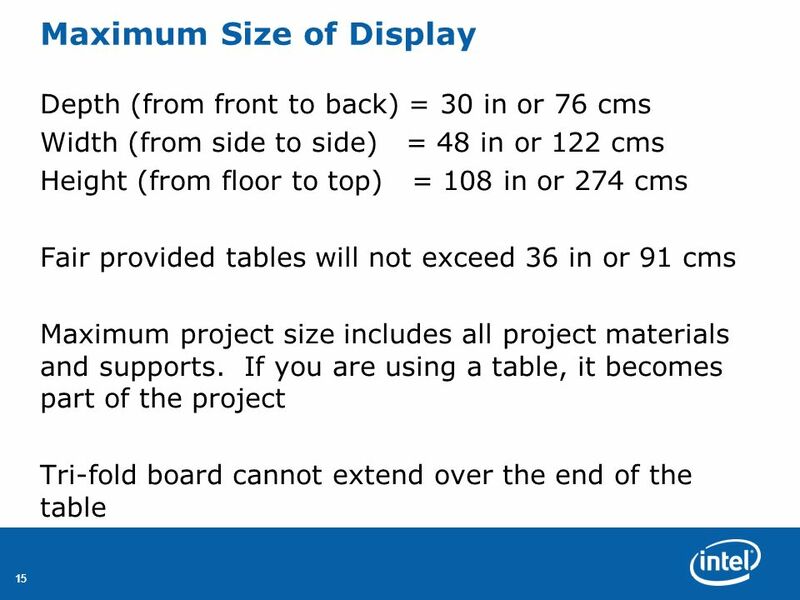 The general text of each section needs to be the same size throughout and large enough that it can be read from a distance of nothing closer than one meter. 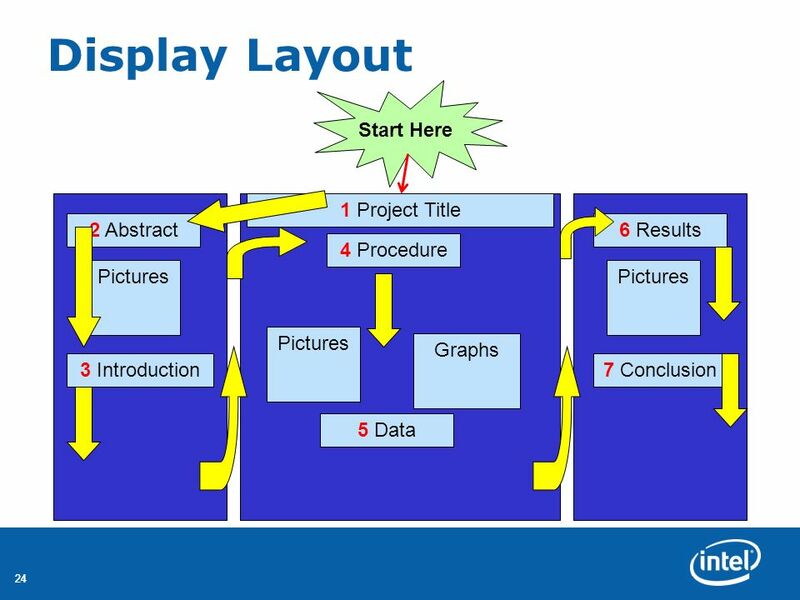 Summarize your project – do NOT read your abstract How did you get the idea? 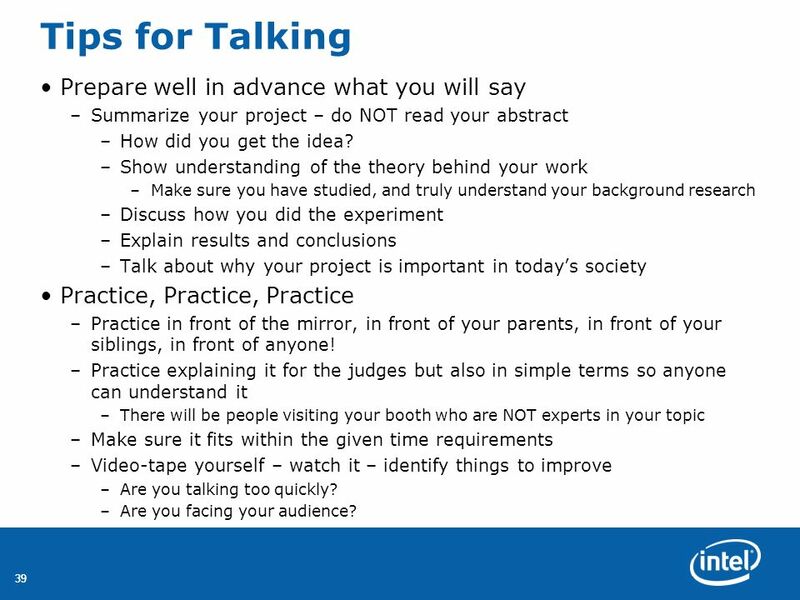 Show understanding of the theory behind your work Make sure you have studied, and truly understand your background research Discuss how you did the experiment Explain results and conclusions Talk about why your project is important in today’s society Practice, Practice, Practice Practice in front of the mirror, in front of your parents, in front of your siblings, in front of anyone! 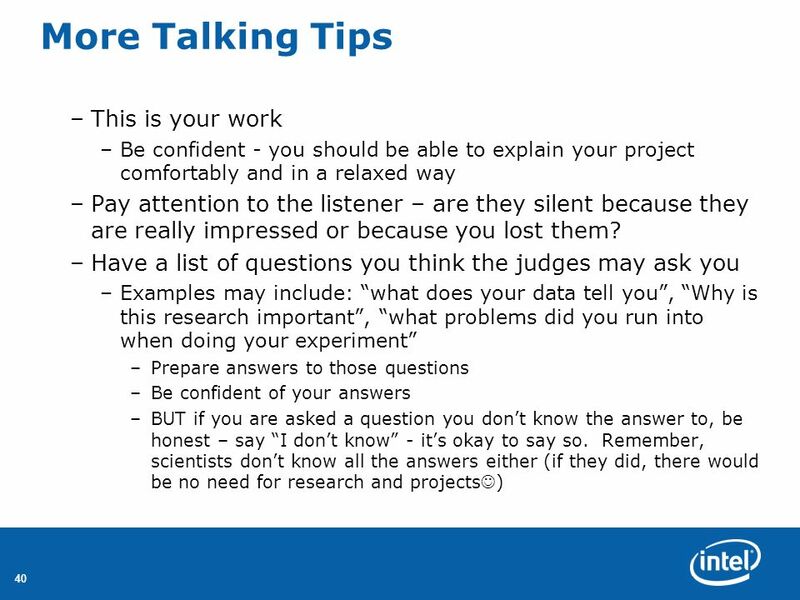 Practice explaining it for the judges but also in simple terms so anyone can understand it There will be people visiting your booth who are NOT experts in your topic Make sure it fits within the given time requirements Video-tape yourself – watch it – identify things to improve Are you talking too quickly? 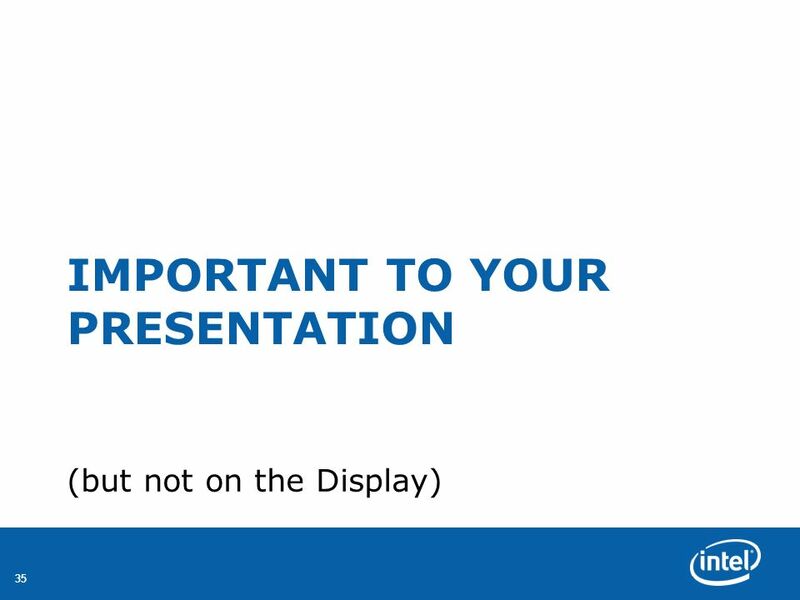 Are you facing your audience? 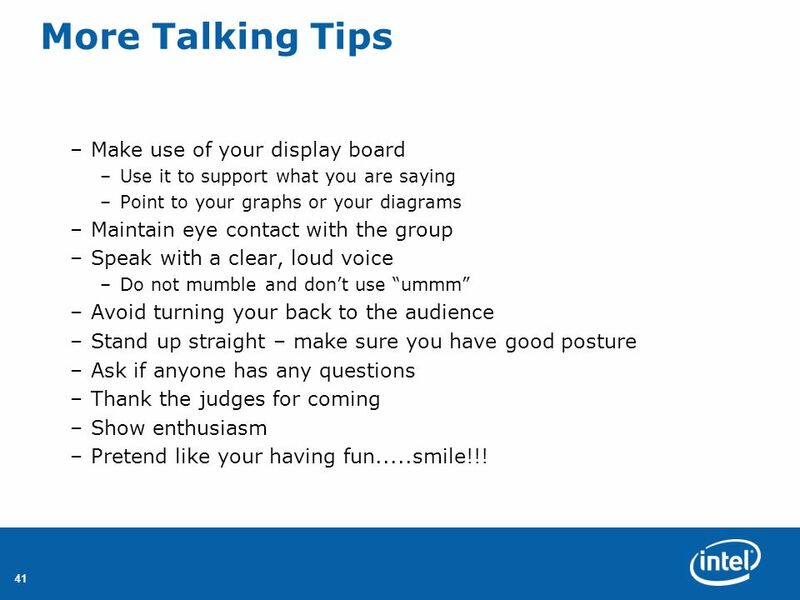 Use it to support what you are saying Point to your graphs or your diagrams Maintain eye contact with the group Speak with a clear, loud voice Do not mumble and don’t use “ummm” Avoid turning your back to the audience Stand up straight – make sure you have good posture Ask if anyone has any questions Thank the judges for coming Show enthusiasm Pretend like your having fun.....smile!!! 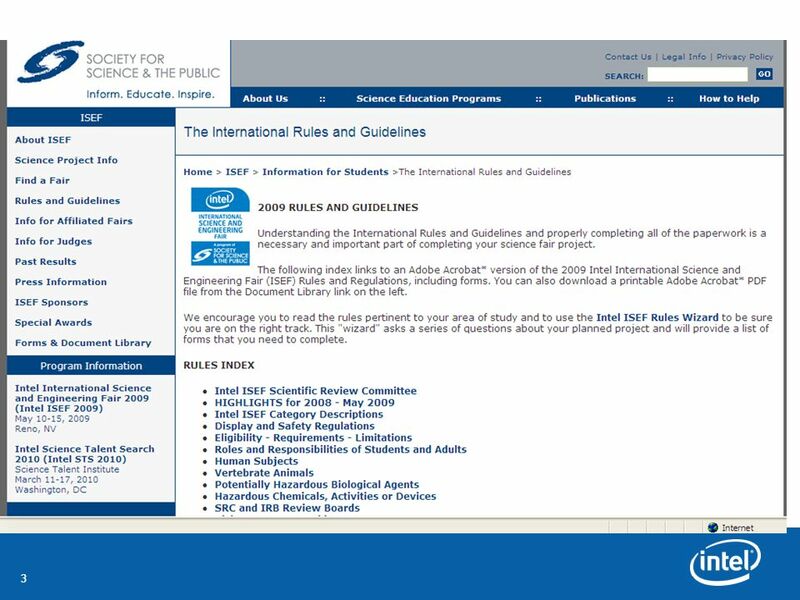 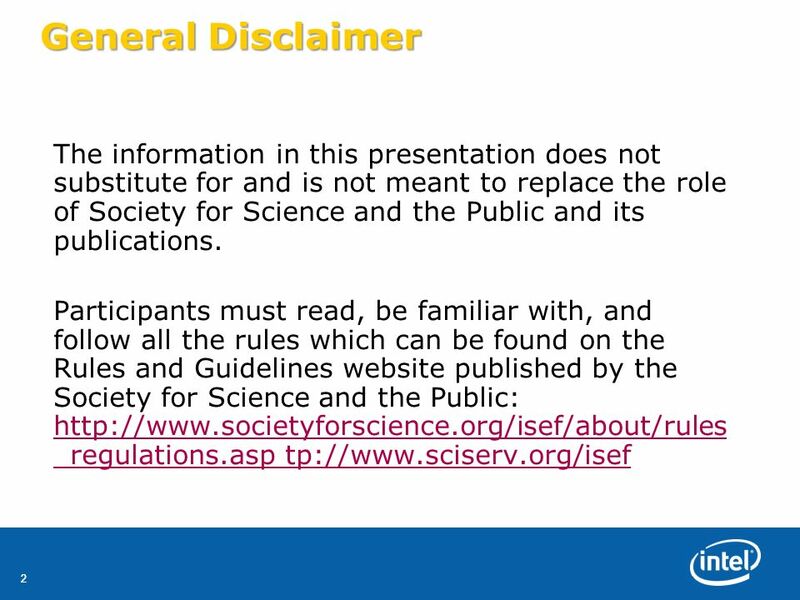 “Do you want to hear about my research project?” “Come over, and I will show you what I did in my research?” Ask questions of the Judges “What do you do?” “Why are you a judge for Intel ISEF?” Enjoy yourself and share what you have learned! 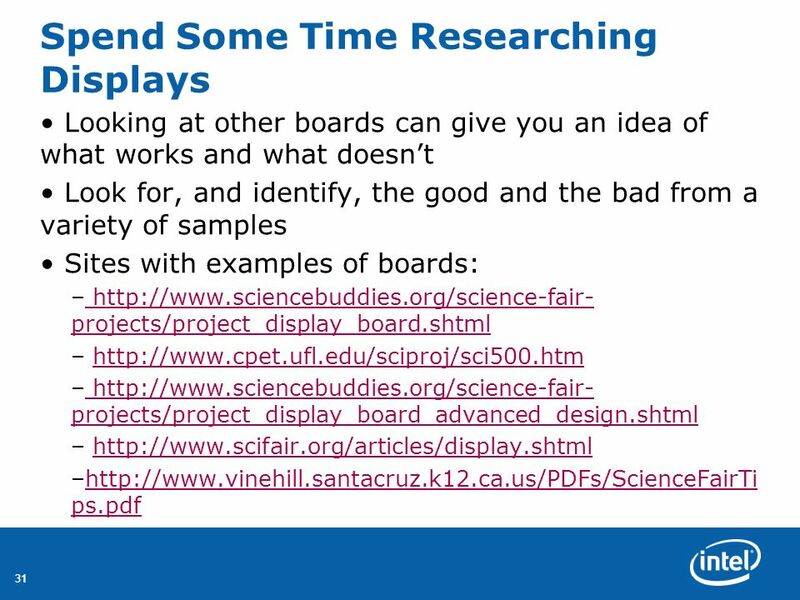 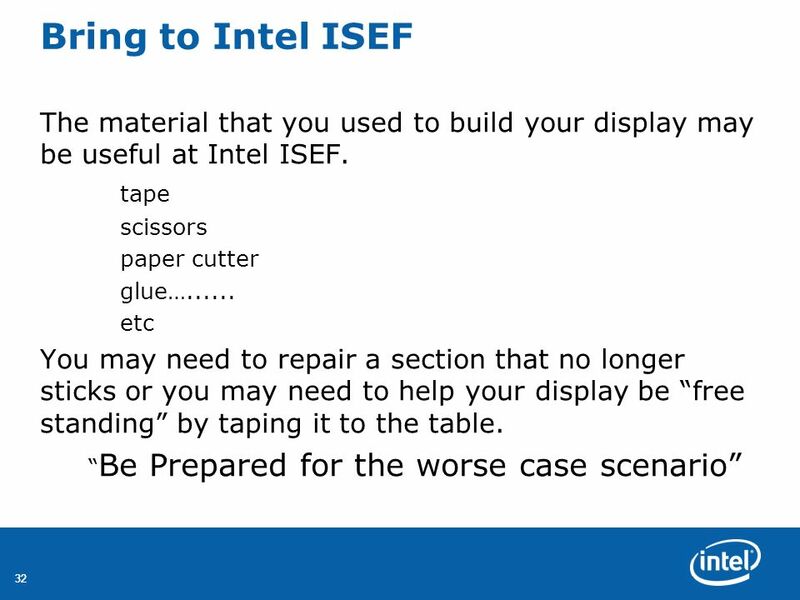 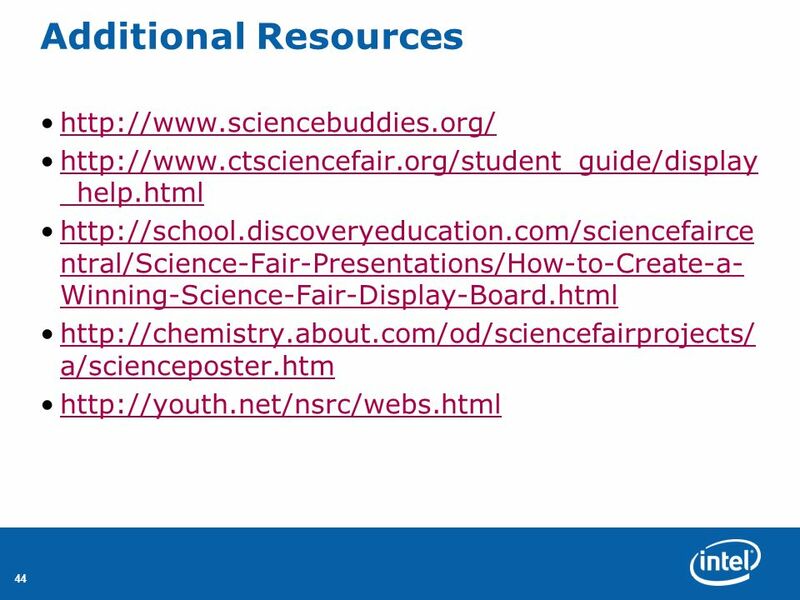 Download ppt "How to Create an Intel ISEF Display"
3/3/20141 Designing an Intel ISEF Affiliated Science Fair Project Display Board.